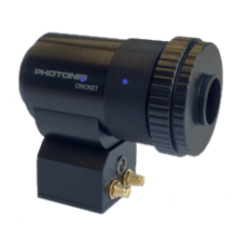 Photonis is a leading manufacturer of electro-optic components used in the detection of ions, electrons and photons. Cricket is a plug and play adaptor designed to convert most scientific cameras into an intensified camera. It features an 18 mm image intensifier and a power supply, including a Hi-QE photocathode with an optional HiCE MCP. The Cricket easily adapts to any camera and lens assembly using a C-Mount, making it simple to adapt the camera into an intensified camera for use in physics, fluorescence imaging, plasma research or corona detection.